If you're not from the northern Midwest, you might not have heard of tater tot hotdish until recently. It's commonly served at potlucks, funeral lunches, and church picnics, but after you try this iconic American recipe, you will want it on the daily. It's creamy, salty, crunchy, and oh-so-craveable. 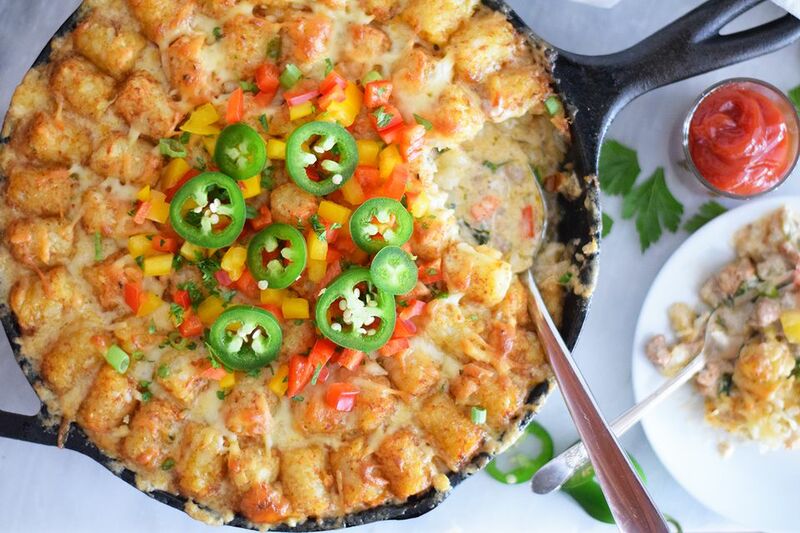 This tater tot hotdish has a classic base with a spicy kick. You can leave out the ingredients with a kick by replacing the peppers with other veggies and swapping pepper jack with cheddar, but it really takes the casserole up a notch. Heat a heavy-bottomed pan on high. Add the ground beef and chorizo and brown the meat until completely cooked through. Preheat the oven to 350 F.
Drain the meat from the pan and place it in a bowl. Leave some of the excess fat in the pan. Add the onion, garlic, peppers, seasoned salt, and ground black pepper to the pan and saute on medium-low heat until the vegetables are slightly softened. Do not overcook them—you want them to retain their shape and some of their texture. Add the heavy cream, whole milk, and cream of mushroom soup to the pot. Simmer for two to three minutes. Add the hot sauce, soy sauce, Worcestershire sauce, sour cream, and cream cheese to the pot and stir until combined completely. It should be thick and creamy. Cook for another minute or two, then remove from the heat. Add the mixture to a large cast iron skillet or casserole dish. Sprinkle half of the shredded pepper jack onto the top of the casserole dish and begin arranging the tater tots on top of the casserole. You can make a pretty pattern or just cover the top of the casserole as best as you can. Add the rest of the cheese to the top of the casserole and place it in the oven for 25 to 30 minutes or until the tater tots are golden brown and the casserole is heated through. Top the casserole with more diced bell peppers, chopped cilantro, and sliced jalapenos if you wish to make it extra spicy. Taco Tater Tot Hotdish: Fill the casserole dish with prepared taco meat mixed with cheddar cheese soup mix. Top with tater tots and pepper jack cheese. When it's done baking, drizzle with sour cream, salsa, chopped olives, and chopped scallions. Bacon Cheeseburger Tater Tot Hotdish: Cook up the ground beef as directed and add in bacon. Keep the cream of mushroom soup, but change the veggies to just corn (or you can leave them out). Top with tater tots and cheese and bake! Ham and Broccoli Tater Tot Hotdish: Use a pound of chopped ham, cream of mushroom soup, and chopped broccoli. Top with tots and bake away. Add some cheddar if you want this creamy and cheesy. Cheesy Chicken Tater Tot Hotdish: Replace the beef with shredded chicken and the soup with cheddar cheese soup. Add a packet of ranch seasoning and a veggie of your choice. Top with tots and cheese.